Termite Control Tips McKinney Homeowners Have Been Asking For ! Each year, McKinney homeowners experience thousands of dollars worth of termite damage per home. The Dallas MetroPlex is the #9 state nationally for termite activity. 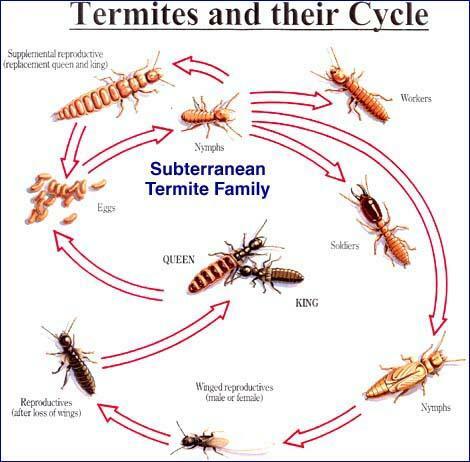 In north Texas, we have subterranean termites, these are the types of termites live underground. They enter structures through cracks and openings in and around foundations. Quite often, extensive damage is done before the unsuspecting homeowner realizes they have a problem. Locating the site of termite activity isn’t always easy. Romex Pest & Termite Control recommends having your home or business inspected by a trained professional. Preventing and treating termite infestations is a top priority for many homeowners. Termite control is not a do-it-yourself project, however; homeowners should always hire a certified pest management professional when treating or preventing termite infestations. Termites — subterranean, drywood, and dampwood — infest different regions of the country, live in large colonies, and are the No. 1 wood-destroying pest in the country. Preventive measures for termites include treating the soil surrounding the house with pesticides, installing barriers around the home, a combination of the two, or less toxic bait-and-monitoring systems. . . . Regarding Termite Barriers . . . Physical barriers are an effective defense in the fight against termites. They are typically installed in new homes as part of the foundation. These can be strictly material barriers or contain a termiticide to kill or repel any termites that approach and attempt to penetrate the barrier. Mesh barriers are usually made of stainless steel with holes too small for termites to crawl through and too strong for them to cut through. Mesh barriers can be installed as part of the foundation, around the perimeter of the home, under the slab, and at potential entry points such as service pipes. Aggregate barriers that are comprised of sand or rock particles that are too big for the termites to move and too close together for the termites to tunnel through are also used under and around the foundation of a home. Granitgard uses pesticide-free concrete and road-sealing particles to keep termites out. Plastic barriers are used around service and utility pipes within the home. These barriers are installed as part of the foundation and are often capped with concrete. Some plastic barriers include a layer of termiticide as part of the system, such as the Impasse Termite blocker system. Now if a termite barrier wasn’t installed at the completion of your house there is no need to worry, Romex Termite Control has got you covered patented Romex Termite Inspection which we have developed over the years to help us provide excellent costumer service. Feel free to give us a call or fill out a form and we will help you with any and all termite problems.